How Does He Help You: He provides you with your free estimate. Then he schedules your work and can help with any questions. Call the office at 973-635-7900 to schedule an estimate. I have been designing and building my entire life. After graduating from Michigan State University with a degree in scenic design, my wife and I moved to Hoboken in order to pursue a career in the theatre. I worked in off-broadway theatres and eventually landed at The Parade Studio, building the floats for the Macy’s Thanksgiving Day Parade. Then in 1980, we purchased our first home. The house was an 1860s 3-story townhouse and a fixer-upper in every sense of the word. The skills I learned renovating that house formed the foundation for my future career. Because I transitioned to working as a renovation contractor, cabinet-maker and a home builder. Maureen and I have since moved to Green Village where we raised our 2 sons and renovated our next home, a cape cod on 2-1/2 acres surrounded by the Great Swamp. Professionally, I have continued building both residential and commercial projects in NYC and suburban NJ. 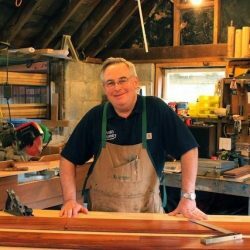 I am a trained cabinet-maker and have designed and built cabinetry, furniture, wall units and beautiful paneled rooms and millwork. Over the years, I have built new homes and additions, restored historical buildings and renovated the interior and exteriors of countless homes and apartments. I met Ty Monk 6 years ago when I hired him to paint a new home I was building in Chatham. Since the project was a great success, we continued to work together. Now, we are co-workers and I couldn’t be prouder to be a member of the Monk’s team. I have the opportunity to use all of my skills and experience helping people to maintain and improve their homes. Angelo Santoro manages all types of home improvement projects in Chatham, New Vernon and Green Village, NJ. If you would like to talk to Angelo Santoro, please give us a call at 973-635-7900. Estimate appointments are Tuesday – Saturday. After your Project Manager takes measurements, you are invited to make an appointment with a Designer in our Showroom. While you are welcome to pop in, an appointment guarantees you undivided attention for an hour and a half. You can shop for Cabinetry, Countertops, Tile, Flooring, Hardware, Vanities, Windows & Doors.